Here is a Google Map of the trip locations. Eyeing me up. 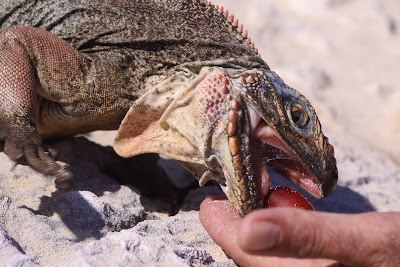 The iguanas were aggressive and cautious at the same time. 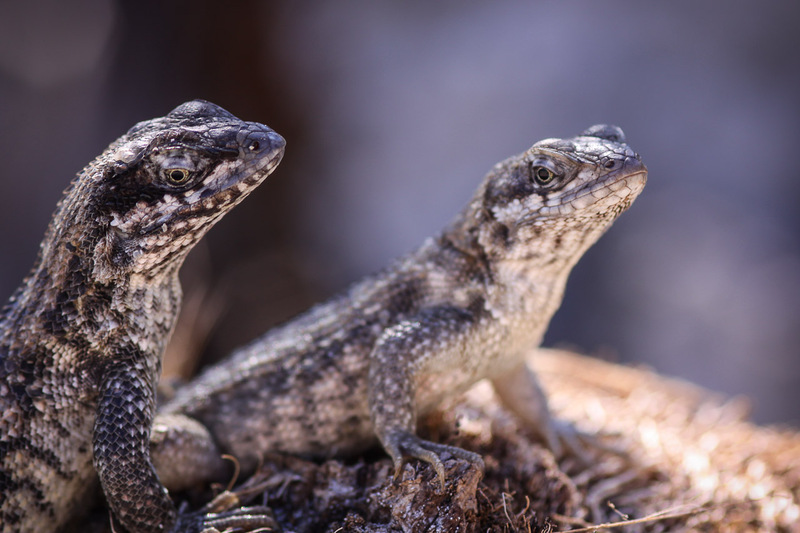 Two juvenile iguanas sunning themselves while the bigger ones fed. View from the dock. The deck is where we ate lunch and tossed our lunch scraps to the sharks. Click for larger view. 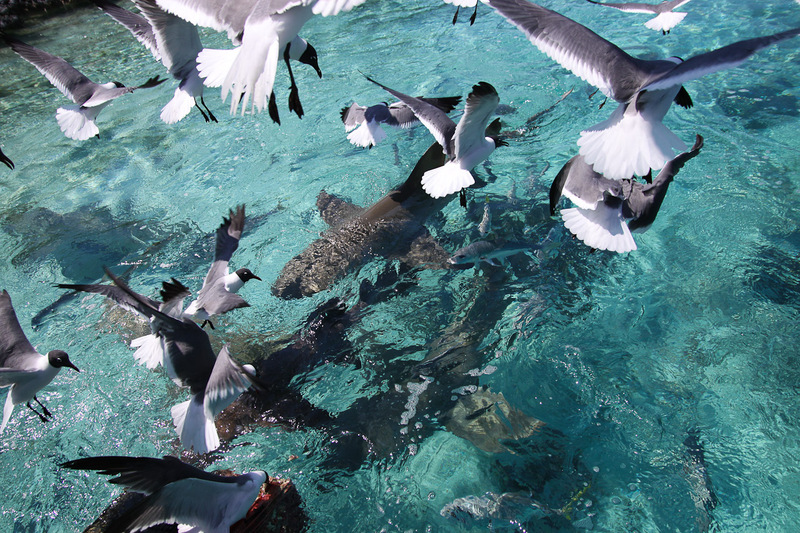 Feeding the sharks and seagulls. 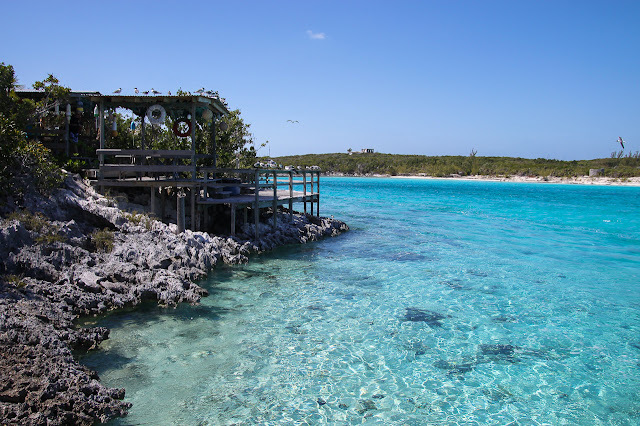 The next stop was at Little Norman's Cay (pronounced "key"). Right after the boats tied off we watched as the trip organizers tossed two milk crates full of scraps into the water. 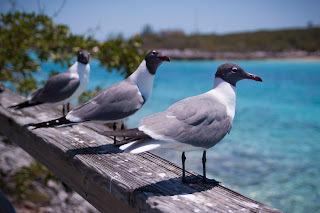 The lemon sharks, nurse sharks, and what seemed like a hundred seagulls that occupied the waters around the dock all took this as a sign it was time to eat as they swarmed the crates that has been thrown in the water. 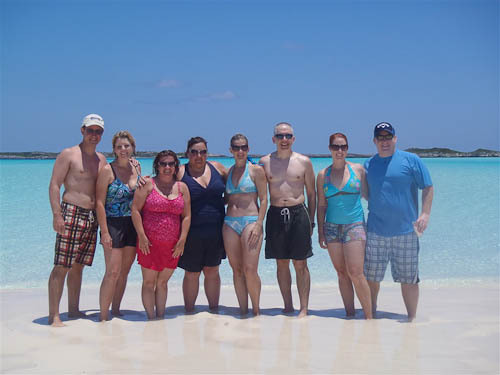 Then we walked around the island to a spectacular beach and enjoyed some time to explore. 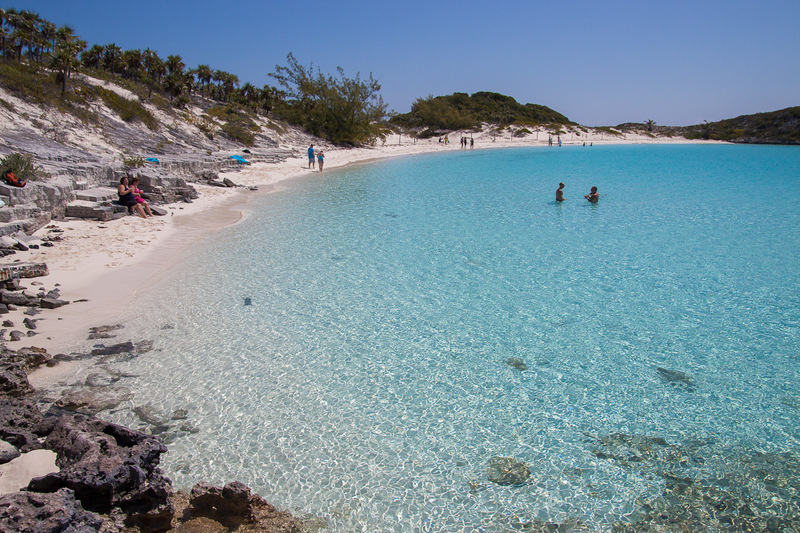 The beach at Little Norman's Cay. It was just like a swimming pool. Click for larger view. I found a trail leading up through the brush and vegetation, destination unknown. I decided to take it and after crawling through a few small tree branches and over coral steps I arrived at the highest point on small island. As soon as I got up there and took in the entire scene, looking down on everyone in our party, I knew it was the perfect opportunity for a 360° panorama. I've posted the shot here and a navigable panorama is embedded below as well. I also posted a huge copy (9,000px wide) on my Flickr page. Click the image below with your mouse and drag to look around. Use the "A" key to zoom in and the "Z" key to zoom out. You can also use the mouse scroll wheel to zoom in/out. Click and drag the image to scroll around. You can also view the above scrolling panorama 4x larger. Click here to load a larger copy of the panorama in a new window. That's me with an underwater camera! After exploring the island for a little while an announcement was made that anyone wanting to go snorkeling should board the boats. They didn't have to tell me twice and we high-tailed it to the boat, got some snorkeling gear (which they provided), and loaded up. It was a short trip around the island to the snorkeling spot (see the locations on the Google Map). The snorkeling spot seemed to range in depth from 12-25' (~4-8 meters) and included a mixture of sandy and coral bottom. 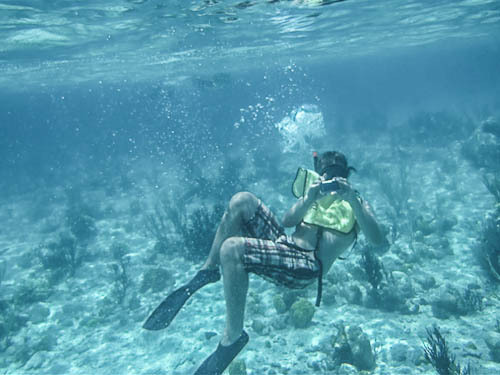 We observed a decent range of Caribbean fauna including angelfish, triggerfish, butterflyfish, surgeonfish, parrotfish, damsels, chromis, and wrasses. Also saw some pretty invertebrates up close too including many species of soft and hard coral and Christmas tree worms. I was especially tickled to find a bluehead wrasse because that was one of the species I used to have in my saltwater aquarium back home. 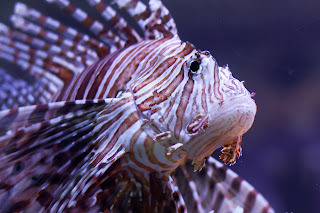 One thing I didn't observe but was watching for was the venomous lionfish. 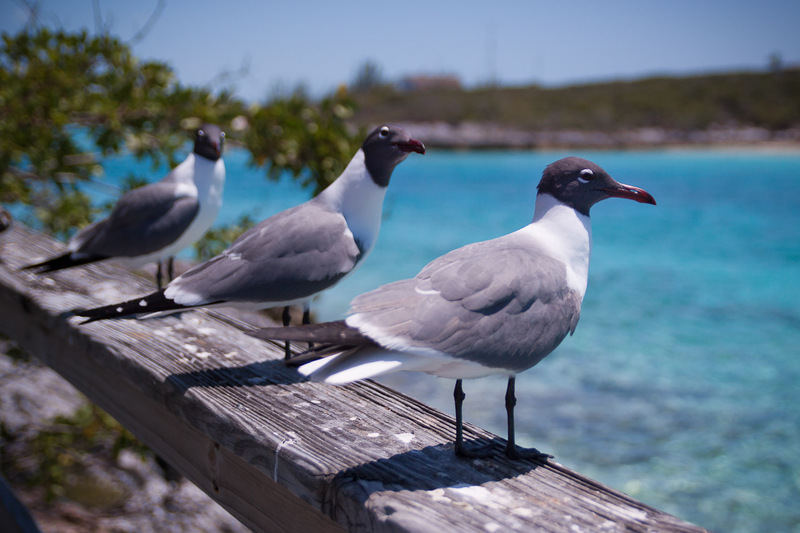 People that know seem pretty upset that this introduced species is seeming to thrive and can be found in many reefs around the Bahamas. I went spear fishing on my last trip in November and our guide encouraged us to spear them just to kill them. When we did, he'd avoid the poisonous spines and toss them onto the exposed reef rocks above. Sure it was a drop in the bucket for population control, but a few less lionfish is still a few less lionfish. There seem to be conflicting reports for the source of the species introduction. Some research points to a broken aquarium in southern Florida from Hurricane Andrew in 1992. 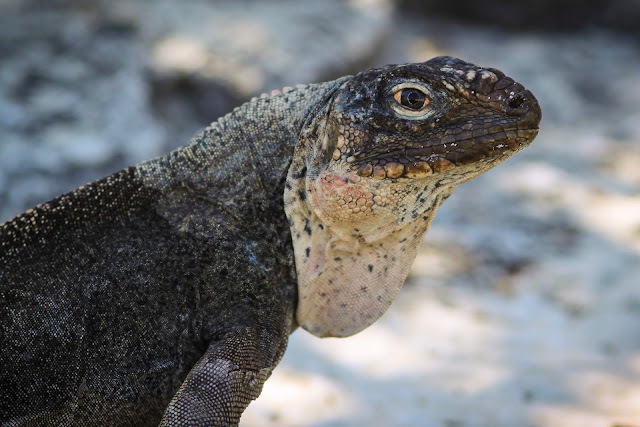 Other research indicates that the species may already have been in the Caribbean and southern Florida waters since 1985. Some locals, including a couple people I heard it first hand from, blame the Atlantis resort on Paradise Island (they do have a large lionfish exhibit). In any case, it looks like that fish is here to stay. The exact spot we landed. After snorkeling was done, we made one more pit stop while out on the water. And this pit stop was literally out on the water. 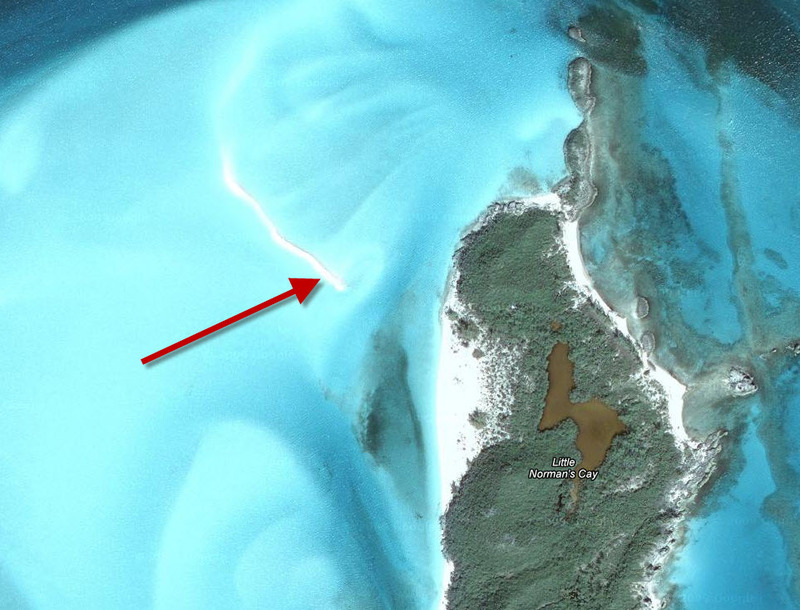 Just northwest of Little Norman's Cay there is a sandbar in the middle of the water. It was just barely exposed when we went by earlier in the day, but when we got there in the afternoon it was exposed enough for us to explore. The two large boats pulled up and anchored only a few feet from the edge. We piled out and waded across waist high water to walk on what might have been the whitest, most pristine sand my feet have ever touched. We sat, walked, took photos, and just enjoyed living in the moment. But after about 20 minutes we were really starting to feel the hunger, and off we went to meet that exact need. After all those activities it is not an exaggeration to say we were starved and ready for lunch. We got back to the dock and wandered up to the bar where our hosts had laid out a nice lunch. Of course the bar was still open as it had been since our arrival. A few rum punches go quite well with lunch in a tropical paradise like this. 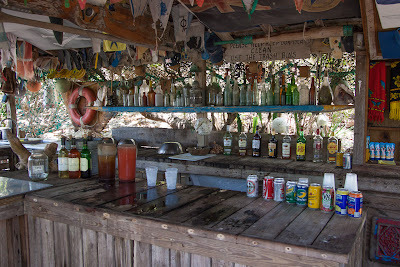 The bar on the island. Click for larger view. As we finished lunch our island host told everyone that any scraps could be taken down to the shark feeding part of the deck and tossed into the water. It didn't matter what the scraps were: chicken bones, bread. pasta, veggies, fruit...it would all be eaten. And they were 100% correct. Although it wasn't just the sharks that get fed, it really ends up being more for the seagulls. 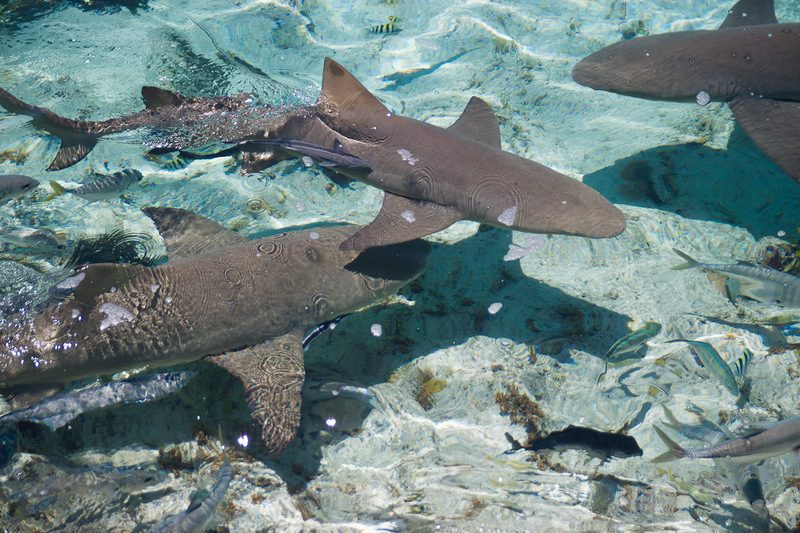 They had no fear and would fly down to the surface of the water, dodging the jaws of the sharks to try and snag a morsel of food. If that didn't work, they'd dive to try to catch the food in flight. It was quite a competition to see how much food we could get to reach the water without it being snagged in mid-air by the gulls. the water. Click for larger view. The seagulls sat close by. Click for larger view. After lunch we finished with a few moments to enjoy the beach one last time. We were then corralled back to the boats and began the journey back to Paradise Island. A day where I don't think there's a single thing I could complain about, even if I tried. This, my friends, is what a vacation is all about.